The Matson Line's Malolo was built by W. Cramp & Sons, Philadelphia. Launched in June 1926, Malolo nearly met with disaster even before her maiden voyage. During her sea trials in May 1925 she collided with the Norwegian steamer, Jacob Christensen, in fog off Nantucket. Malolo was so badly damaged that she had to be towed to New York, taking on some 7,000 tons of water in the process. Another five months of work was necessary before she was ready to be delivered to her owner. 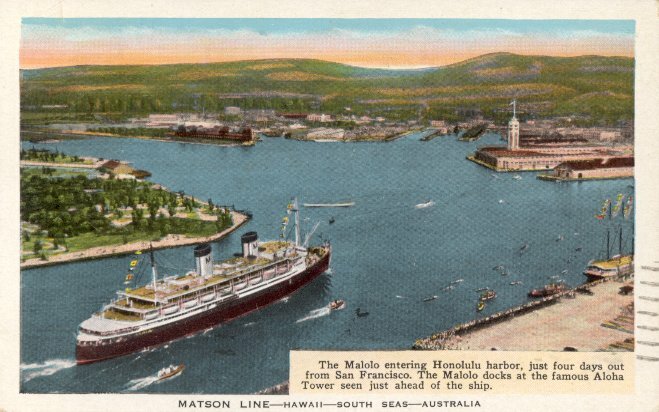 Malolo finally made her maiden voyage on Matson's regular San Francisco to Honolulu service on 16 November 1927. She remained on that service until World War II, although in 1937 she was refitted and renamed Matsonia. Matsonia was converted into a Navy transport in 1942 and served in that role throughout the War, resuming Matson Line service in May 1946. After a brief lay-up in 1948, the ship was sold to the Home Lines, refitted at Genoa and renamed Atlantic. 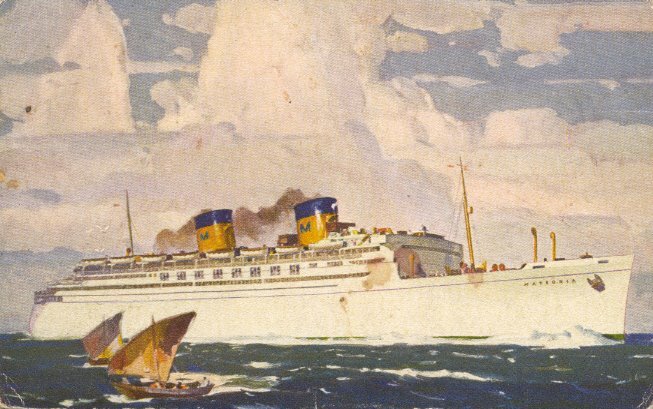 Atlantic made her first voyage for Home Lines on 14 May 1949, from Genoa to Halifax and New York and beginning in 1952 she served on a Southampton-Canada route. After one final Genoa-New York trip in November 1954, she was sold again, to Hellenic American Line, and renamed Queen Frederica (Vasilissa Freideriki). She began her service for Hellenic American with a 29 January 1955 trip from Piraeus to New York. Hellenic American also used her on a variety of routes from northern Europe to Canada over the next ten years. In 1965, the ship again changed hands, and her new owner, Chandris Lines, used her on its Mediterranean-New York and Southampton-Australia routes as well as for cruising. Except for some 1973 cruises, Queen Frederica was laid up from 1971 until 1977 when she headed for the shipbreakers. During her breaking-up, she caught fire and her remains were demolished. Sources: Kludas' Great Passenger Ships of the World; Miller's Pictorial Encyclopedia of Ocean Liners, 1860-1994; Bonsor's North Atlantic Seaway.